Why is Israel calling Iran a nuclear duck? "A nuclear armed Iran must be stopped," Benjamin Netanyahu told the American Israel Public Affairs Committee (AIPAC) lobby group in Washington on Monday. "Amazingly, some people refuse to acknowledge that Iran's goal is to develop nuclear weapons." So, how might Israel's prime minister try to persuade the sceptics? A couple of paragraphs later,Mr Netanyahu decided to deploy a favourite rhetorical device of recent Israeli leaders. It's a phrase always used whenever an Israeli politician wants to come over as wittily plain-spoken to English-speaking audiences - the duck analogy. "Ladies and Gentlemen, if it looks like a duck, walks like a duck, and quacks like a duck, then what is it?" Mr Netanyahu asked. "That's right, it's a duck - but this duck is a nuclear duck. And it's time the world started calling a duck a duck." Let's be clear - Israel does not claim the duck analogy as a native Hebrew saying. It's a phrase that Israel has consciously borrowed from the United States in order to use with English-speaking audiences. The saying, sometimes referred to as "the duck test", was popularised in the US in the first years of the Cold War, when it was used to describe suspected Communists. "I can't prove you are a Communist," said Emil Mazey of the United Automobile Workers at a labour meeting in 1946. "But when I see a bird that quacks like a duck, walks like a duck, has feathers and webbed feet, and associates with ducks - I'm certainly going to assume that he is a duck." Richard Cunningham Patterson Jr, US ambassador to Guatemala in 1950, made similar observations about the Guatemalan government of the day. "Suppose you see a bird walking around in a farmyard. This bird has no label that says 'duck'. But the bird certainly looks like a duck," he said. "Also, he goes to the pond and you notice that he swims like a duck. Then he opens his beak and quacks like a duck. Well, by this time you have probably reached the conclusion that the bird is a duck, whether he's wearing a label or not." To some English speakers, this phrase now sounds firmly stuck in the 1940s and 50s. But the saying has taken on a second life in Israel - where it is routinely deployed in statements made to foreign reporters. "Listen, let's not fool ourselves, OK?" said Avraham Burg, the speaker of Israel's parliament during negotiations for a two-state solution in July 2000. "If it walks like a duck, if it talks like a duck, if it sounds like a duck, it's a Palestinian state." The most prolific user of the duck analogy may be Israel's Defence Minister Ehud Barak. "Yasser Arafat happens to behave like a terrorist, he looks like one, he walks like one, he quacks like one, so maybe he is really a terrorist," he told reporters in Washington in 2002. The death of Arafat in 2004 forced Mr Barak to seek a new target for his saying. He began to transfer the analogy to Iran. "It's clear that they [Iran] are determined to reach nuclear capability," Mr Barak told PBS in November 2011. "None of the series of experiments that they were running can be explained other than their pursuing a nuclear military capability. If it looks like a duck, walks like a duck and quacks like a duck - it's a duck." Other politicians visiting Israel sometimes sense the importance of using the phrase with Israelis. In February 2002, Czech Prime Minister Milos Zeman conducted an interview with an Israeli TV channel. Image caption Former Czech PM Milos Zeman failed in his attempt to use the "duck analogy"
"Do you imply that there are similarities between Hitler's Third Reich and Arafat's Palestinian Authority?" asked the Israeli interviewer. "Of course, it is," replied Mr Zeman in English. "First of all, let us define the terrorism. The terrorism I think is the political movement which uses the civic victim as a tool for political tasks. "Let me finish by some English slogan: 'If it looks like a duck, if it goes like a duck, if it cries like a duck, and if it tastes like a duck, it is a duck.'" The prime minister immediately got in trouble for the comparison. His government tried to clear up the mess. The comparison was "a misunderstanding possibly due to an ill-chosen phrase in English", said Mr Zeman's deputy, Vladimir Spidla. 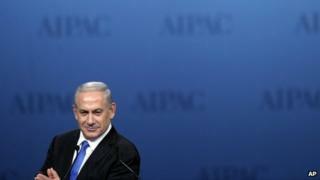 Now Mr Netanyahu has used the phrase in Washington. It was perhaps only time before someone decided that the hitherto silent victim deserved a right of reply. "I've never been so humiliated in all my life," says Daffy Duck in avideo mash-up of Mr Netanyahu's speech posted on YouTube, "Quack, quack."